(Amaretto shrimp) - somehow I missed taking a picture of the crab cake stuffed shrimp, those were GOOD! 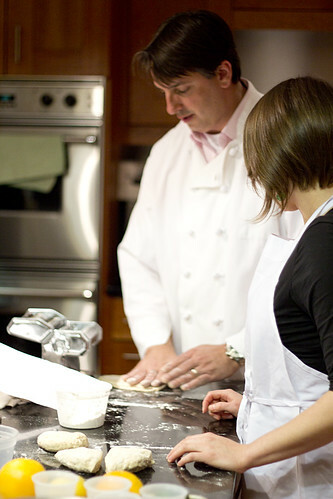 Here he is showing Beth how to make bloody mary bread sticks (they have tomato paste and celery salt in them- and yes he's using a pasta machine to cut them into shape). The class was at the NY Wine and Culinary Center, which is all about sustainability, keeping it local, and educating the public about all things delicious. 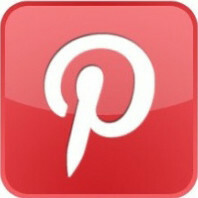 I also learned that they are a not for profit last night, who knew!? 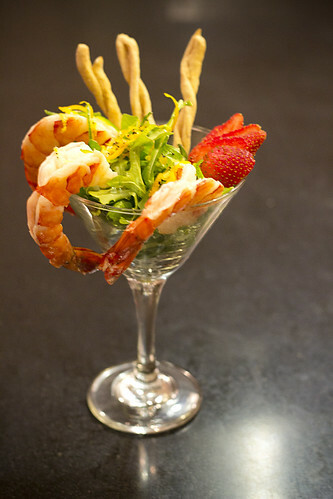 The most common shrimp you'll find in the US are black tiger shrimp, most of which are farm raised in south east asia. This means they have a more mild flavor due to their pellet food eating as apposed to wild shrimp that get to live it up in the ocean. Shrimp aren't classified by size, it's by a count range, aka the number of them you get in a lb. 13-15's are larger than 90-100s...oh come on it's not hard math. There are things called U4's - that means under 4 per pound, talk about serious fatty fatty 2x4s!! The texture of shrimp doesn't change with their size.. you might think those little ones are tougher, but nope, you're probably just cooking the crap out of them. Stop that by the way. 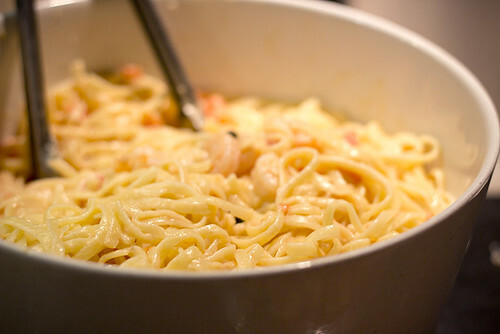 Shrimp don't take long to cook, only a few minutes per side in a pan, anymore than that and your eating rubber... bleh. Reason why you can't refreeze things after thawing: The shrimp are commercially IQF (individually quick frozen) which is taking their temp down to freezing in 20 minutes flat, so ice doesn't form the same way as when you do it at home. At home they are freezing slowly and all those little moisture particles are forming into ice shards, tearing apart the insides of your not so tender anymore, shrimp. Re-freezing: don't do it. 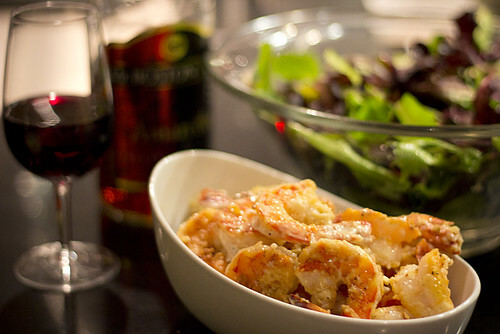 Amaretto Shrimp - I got to make this one!! 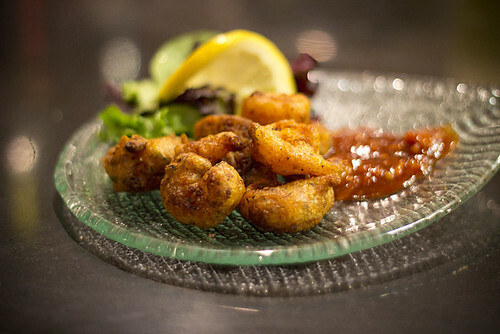 Dredge shrimp and shake off excess cornstarch. Heat a large saute pan over high heat until hot. Add enough oil to lightly coat the bottom of the pan. Sear shrimp on both sides until shrimp is pink and just begin to curl. Remove from pan and place in bowl, toss with amaretto sauce and chopped nuts. Saute onion in a small amount of oil, add rest of ingredients and bring to a simmer. Remove from heat and set aside. Season shrimp with salt on both sides. In a small bowl combine the coconut and flour. Dip shrimp in egg then dredge in coconut mixture. Fry in hot oil until golden. Drain on paper towels. Serve with chutney. Stunning photos! The colors are all so vibrant, and the lighting is fantastic. I should not have read this post this close to dinner. 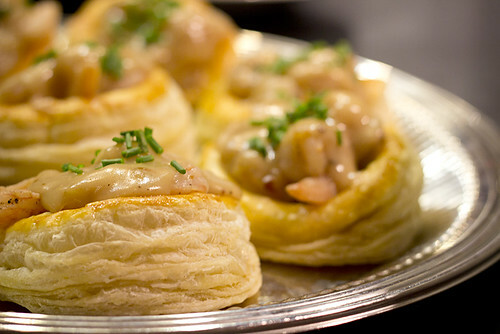 I'm starving all of those dishes look fantastic, especially the vol au vents! YUM! This almost makes me want to give shrimp a second shot. Almost. Sounds like a fun time!! You made this shrimp lover very happy! Coming from you that is such a HUGE compliment! Thank you! I fully admit I didn't even know what col au vents were before this class! Delicious though! 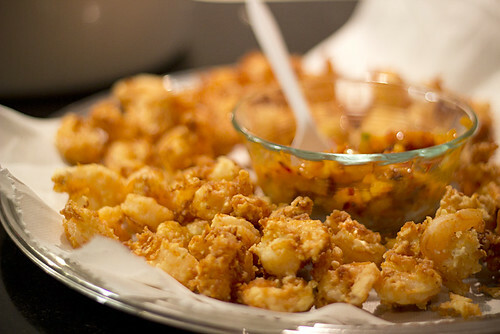 These recipes sound delicious -- love anything with shrimp in them.